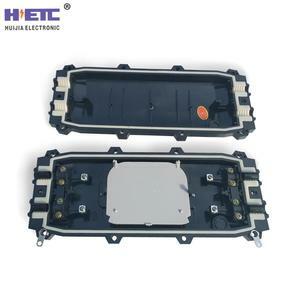 Ningbo Huijia Electronic Technology Co., Ltd.
Dome type 24 48 96 144 core Fiber optic splice closure splice enclosure DYS 008 of fiber closure is used for connecting and protecting singal core or bunch cables. We have 4 production lines for fiber optic cable, 2 high standard MPO/MTP jumper assembly lines, 8 production lines for standard jumper and 10 PLC Splitter production lines. Our high quality products and outstanding service win the customer from all the world, DYS fiber optic is looking forward to cooperate with you. 1. Scope o f a pplication This Installation Manual suit s for the joint closure (Hereafter abbreviated as FOSC), as the guidance of proper installation. 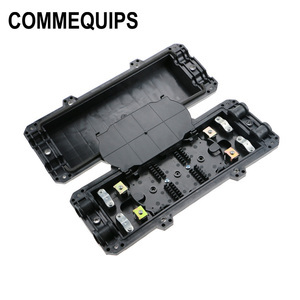 Name of components Quantity Usage Remarks 1 FOSC cover 1 piece P rotecti ng fiber cable splices in whole Height x Diameter 208mm x 132mm 2 Fiber optic splice tray (FOST) Max. C onfiguration as per specification 9 Insulation tape 1 ring Enlarging diameter of fiber cable for easy fixing 10 Metal hoop 1 set For wall mounting and pole hugging 11 Buffer tube decided by customers Hitched to fibers and fixed with FOST, managing buffer. 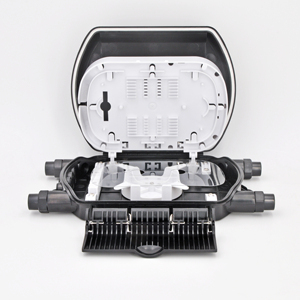 vertical outdoor 96 core fiber optical splice closure, 24 core fiber optic splice closure price Features: fiber optic splice closure 1.Water and dust proof 2,M in and N out 3ABS plastic material 4.Color:black Specifications: 1, Two- way cable entries and exists design 2, Can be reopened 3, Can be fixed by metal work 4, Clear optical fiber cable 5. 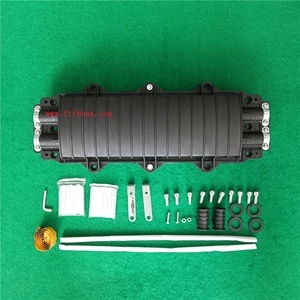 Closure body is made by Super ABS material, and the bolt was made in stainless steel 6 Great corrosion resistance 7. Suitable for any harsh environment Port 1&times;2,1&times;4,1&times;8,1&times;16,1&times;32,1&times;64, 2&times;4,2&times;8,2&times;16,2&times;32 Fiber Type G652D, G657A Package Steel tube; ABS box Input Fiber Type 900&micro;m Loose tube, 2.0mm, 3.0mm, 250&micro;m Ribbon Fiber, Adapter Output Fiber Type 900&micro;m Loose tube, 2.0mm, 3.0mm, 250&micro;m Ribbon Fiber, Adapter Pigtail Length 0.5&ndash;2.0m, Adapter, Others Connector Type FC/UPC, FC/APC, SC/UPC, SC/APC,ST/UPC, LC/UPC, LC/APC, None, Others pictures: Payment and Delievery: Payment : L/C, T/T, Western Union, Moneygram,Paypal as well as Cash acceptable Delievery: Shipment is usually delivered within 1-5 working days after receiving payment. The goods is usually sent by express way(TNT,UPS,FEDEX,DHL,EMS or other special way) or by ship as per customers' exact quantity and requirement. The elastic rubber seal rings inside the closure are of good sealing and sweat-proof performance. 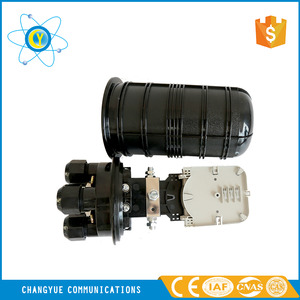 The air valve is provided for the closure and used to check the sealing performance. 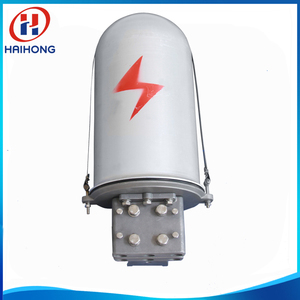 The fiber optic splice closure can bear the axial tensile strength no less than 1000N. 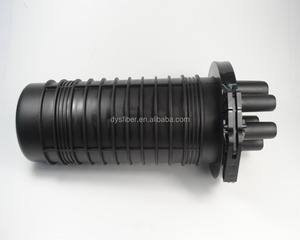 Alibaba.com offers 907 fiber optic splice closure price products. About 95% of these are fiber optic equipment, 1% are other telecommunications products, and 1% are power accessories. A wide variety of fiber optic splice closure price options are available to you, such as free samples, paid samples. 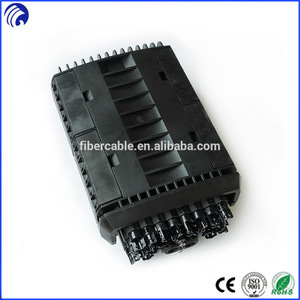 There are 907 fiber optic splice closure price suppliers, mainly located in Asia. 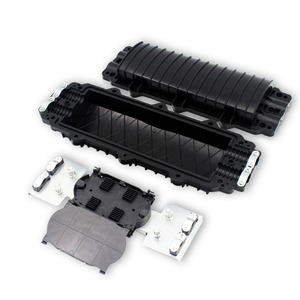 The top supplying country is China (Mainland), which supply 100% of fiber optic splice closure price respectively. Fiber optic splice closure price products are most popular in South America, Eastern Europe, and Southeast Asia. You can ensure product safety by selecting from certified suppliers, including 303 with ISO9001, 48 with ISO14001, and 45 with OHSAS18001 certification.